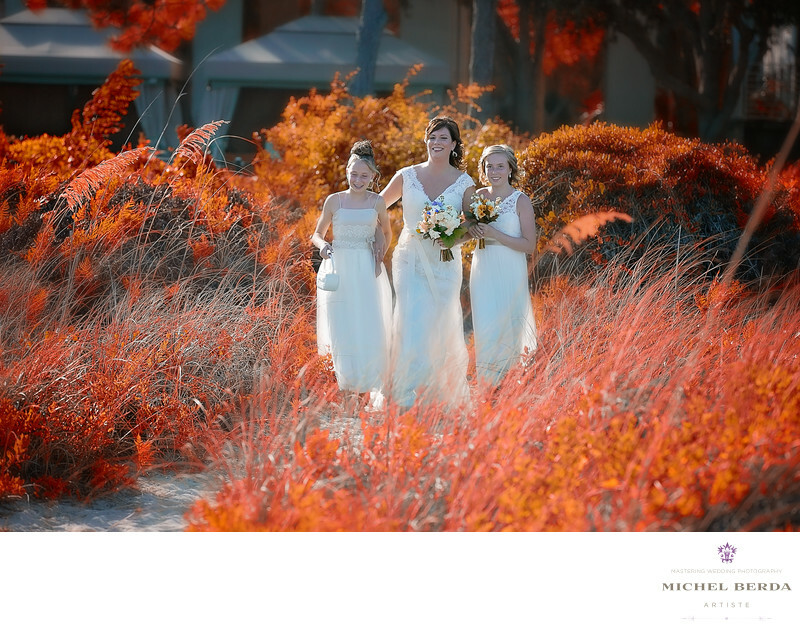 As a wedding photographer in Hilton Head, South Carolina, I am always in awe of how beautiful it is there. Only about 2.5 hrs from Charleston, South Carolina. I enjoyed driving there and taking in all of the beautiful scenery. It is always a privilege for me to capture weddings for my clients at so many beautiful venues, like The Westin Resort & Spa in Hilton Head, Sc, or Palmetto Dunes, Palmetto Bluff, Sonesta resort and spa, and the Marriott in Hilton head, South Carolina. The beauty to live and capturing weddings in the low country with the beautiful beaches that are miles and miles long, many tourist and locals love our beaches, weddings are also very popular in Hilton Head, South Carolina. As an artist and a master of my craft, I always want to create amazing wedding photos to reflect just that, by capturing in wedding photography various different images and angles. As a great example with this incredible image of the bride being walked down the aisle for a beach ceremony by her beautiful daughters, at The Westin Resort & Spa in Hilton Head South Carolina, I wanted to create art, an image the could reflect just that for decades, an images that shows the deep love for their mother, and an image that would be enlarged in the home very reflective of that special day.